Professor of Law Arlene Kanter was a panelist during the “Strikingly Beautiful: A Celebration of Women & Girls With Disabilities” event held at the White House on Jan. 13. Kanter participated in the “Strike Back” panel, a discussion on violence and abuse prevention specifically concerning women and girls with disabilities. 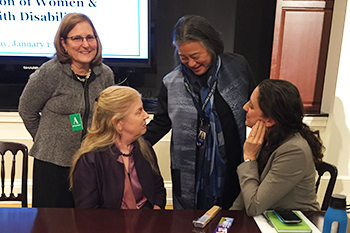 Arlene Kanter, standing at left, converses with (clockwise from upper right) Tina Chen, chief of staff to the First Lady; Caroline Bettinger-Lopez, White House Advisor on Violence against Women; and Stephanie Ortoleva, president of Women Disabled International Inc. The event, hosted by the White House Office of Public Engagement, gathered more than 50 women, many with disabilities, from diverse backgrounds to discuss how to celebrate the many abilities and contributions of women and girls with disabilities within our society. There were also workshops for young women with disabilities from the Washington, D.C., area, who attended the event. A key aspect of the event was a discussion on how to prevent violence against women and girls with disabilities, as women and girls with disabilities are two to three times more likely to encounter violence, abuse and exploitation.